The society aims to further medical education by promoting the exchange of views between health professionals on local health matters and to contribute to informed debate within the professions. There is a monthly lecture programme which, as part of our charitable function, is free to all. Please do come. The programme listings for the current session can be found by clicking on this link. These are the public domain section which includes the programme of meetings, a growing collection of photographs of the West Country and the history of the society. It also includes the abstracts from our own electronic journal, the West of England Medical Journal, and articles from previous issues. Full access to the journal is available via the members section and the journal becomes available to non-members three months later. The programme details for the 146th Session of the Bristol Medico-Chirurgical Society are in draft form and will be publicsied when available. Dr Peter Carpenter, Consultant Psychiatrist, is the President-Elect for 2019-2020 146th Session. 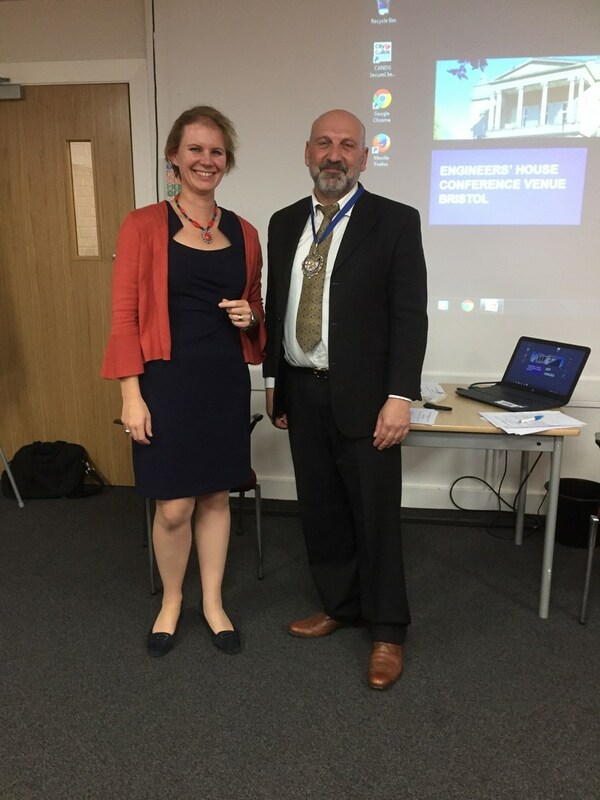 Monika's year as President ended at the Annual General Meeting on Wednesday 10th October at Engineer's House. The society gave her a vote of thanks and in her presidential address summing up the year she remarked that she had "had a blast". The incoming president for the 145th session of the society is Mr. Feras Naaisa. 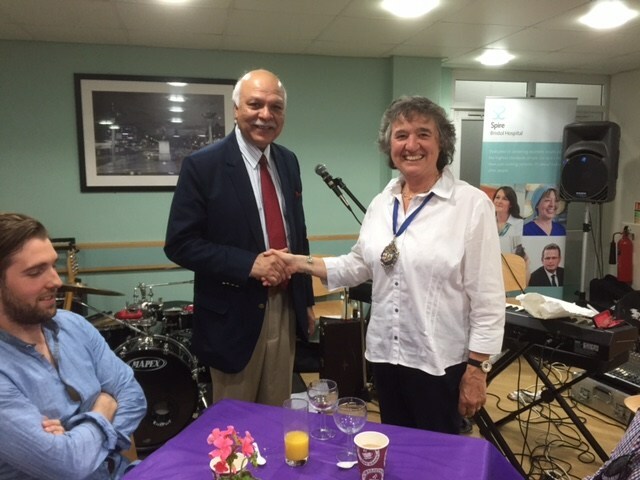 At the end of the AGM Dr. Blackwell handed over the presidential medal to Feras. Mr Naaisa is a consultant gynaecologist in one of Bristol's two gynaecology departments, the Cotwolds Centre, within Southmead Hospital (part of North Bristol Trust). AS you might expect there is a gynaecological twist to the programme he presents for this 145th Session of the Bristol Medico-Chirurgical Society. Please find enclosed the programme of lectures for the 144th Session of the Bristol Medico Chirurgical Society. I am very honoured to be elected as the President for the coming session. I work as a GP in Yate and in Aztec West as well as being an Occupational Health Advisor. My programme this year takes the theme of "Plagues and Pestilences" as I am interested in illnesses or in situations which appear to be on the increase and hope to discuss solutions to some of these. I hope the lectures will be of interest to GPs and Doctors in all specialties. A few meetings are held jointly with related societies. Our Summer Party will take place in the garden of my house in Winterbourne Down - I hope we will be as blessed with good weather as we were for this years' Summer Party at the Penny Brohn Centre. As last year, before each lecture we will have a short presentation by Medical or Dental students of projects they have prepared during the course of their studies. Please encourage your students to come to the meetings - they are eligible for discounts on membership and meals. We are very lucky to have the services of AHM catering again providing us with delicious meals prior to the lectures, and as a member you are entitled to a discounted meal for you and your guests. 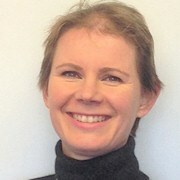 May I remind you also that the website (www.bristolmedchi.co.uk) has new articles which are published on the electronic version of the West of England Medical Journal. We are always looking for new articles and our Honorary Secretary and Editor, Paul Goddard can be contacted either via the website or by email: paulrgoddard@me.com. For any enquiries and to book your meals, please contact our excellent Administrator Sam Walker by email admin@bristolmedchi.co.uk, or if you need to contact her by telephone please leave a message on 07508 792578 and she will return your call. The Committee and I look forward to meeting you during the year and we hope that you will enjoy the programme and bring many guests and colleagues to the meetings. Please find the programme of lectures for the 143rd Session of the Bristol Medico Chirurgical Society in the Programme section of the website. I am very honoured to be elected as the President for the coming session. I was an Oncologist in Bristol for 25 years and have been a parish priest for the last 14 years, and both careers have influenced my choice of topics. How can we enable people with cancer and other medical problems to live a fuller life, moreover could “Living Well” be beneficial to everyone, even if we are currently enjoying good health? I hope the lectures will be of interest to GPs and Doctors in all specialties. A few meetings are held jointly with related societies and our Summer Party will be in the lovely setting of Ham Green House and Gardens, formerly the home of Dr Richard Bright, subsequently part of Ham Green Hospital, and now the National Centre for Penny Brohn UK, which has pioneered holistic care, and is supporting people affected by cancer and providing Living Well courses. As last year, before each lecture we will have a short presentation by Medical or Dental students of projects they have prepared during the course of their studies. Please encourage your students to come to the meetings, they are eligible for discounts on membership and meals. The 141st session was particularly exciting under the watchful eye of the president Professor Davinder Sandhu. Davinder has moved to Bahrain where he has taken the post of Head of the School of Postgraduate Studies and Research, Royal College of Surgeons in Ireland, Bahrain. 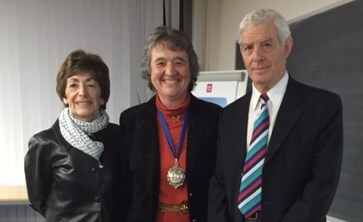 He is pictured handing over the presidential medal to the incoming president for the 142nd session, Miss Lois Tutton, BDS (Hon), MSc, general dental practitioner. 2016 has started with a bang. As usual Hannah's catering was, as usual, excellent. The student presentation from Antonia Northam was well received and gave us all food for thought regarding problems with vocal cords. Dental practitioner Peter Bishop then gave an erudite and convincing exposition on the use of appliances to alleviate muscular and other pains throughout the body. 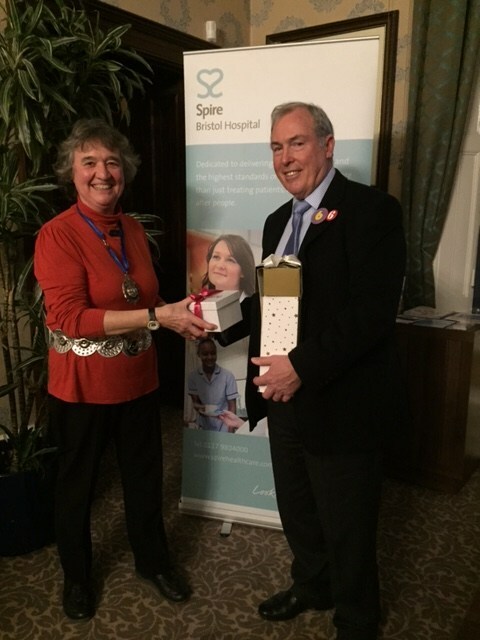 Dental Practitioner Peter Bishop is shown receiving a present from Med Chi President, Lois Tutton. Peter had just delivered an excellent talk to the members and guests. It was also the occasion of his sixty-sixth birthday and we were all very grateful that he had agreed to share the event with the society! Yvette and Tom Baskett are seen on either side of the Med Chi President, Lois Tutton. Tom's lecture, The Pill and the Pope, was enthusiastically received by an audience of sixty-five members and guests.